Promoted: The PEUGEOT 3008 SUV – i-Cockpit | What Car? With its distinctive design, a wealth of in-car technology, and a versatile load space, the PEUGEOT 3008 is one of the rising stars of the fast-growing, family-friendly SUV sector. We gave it a four-star review, singling out particular praise for its stylish high-quality interior, its comfortable ride and its large load capacity. It also impressed us as part of our long-term test fleet. 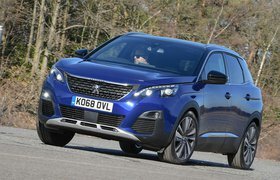 Now, the Fifth Gear team have got their hands on the PEUGEOT 3008 – and presenter Vicky Butler-Henderson was particularly taken with the advanced i-Cockpit®, which defines the 3008’s avant-garde interior. Perfectly complementing the plush materials, soft-touch fabrics, and the satin-chrome and high-gloss finishes that lend the PEUGEOT 3008’s interior a distinctly premium air, the high-tech i-Cockpit® has been designed to make driving easier and safer. It blends a customisable 12.3-inch head-up digital display with an 8in touchscreen and PEUGEOT’s signature compact multi-function steering wheel, giving you clearer control over key features and how you see essential driving information. The 12.3-inch display is mounted higher in the driver’s eye-line for improved visibility, and features a wide array of crisp, colourful graphic dials, navigation prompts and other driving information, which you can configure to your need. The more compact steering wheel not only gives you a clearer view of the display and the road ahead, it also delivers improved feedback and more agile cornering in tight spaces such as car parks. Wonderfully tactile satin-chrome aviation-inspired toggles under the 8-inch touchscreen offer quick and easy access to key features such as air-conditioning, while smartphone mirroring with voice commands provides even easier control of a wider range of apps and features for compatible devices, including navigation, music, podcasts, calls and texts. i-Cockpit® Amplify offers even more ways to customise the interior ambience, using in-car mood lighting and specially developed scents to transform the mood to a more dynamic ‘Boost’ mode or the serene ‘Relax’. The PEUGEOT 3008 SUV hasn’t only been designed to be comfortable, cosseting and easy to use up-front. Despite its compact external dimensions, the PEUGEOT 3008’s extended wheelbase delivers more space inside – especially for the rear passengers, who have more headroom, legroom and elbowroom. The PEUGEOT 3008 is also more practical. Luggage capacity has been improved to 591-litres (VDA) with the rear seats up, and 1,670-litres (VDA) with the ‘Magic Flat’ rear seats down, while a fold-flat front passenger seat lets you carry items up to 3m in length. A two-position boot floor can be used to store the removable parcel shelf or keep items securely hidden from view, while a hands-free tailgate helps make loading even easier. No wonder the PEUGEOT 3008 SUV has won 47 international awards. It’s a serious SUV with added style and technology.